If you are ready to try making soap, you can read books and check out websites, but until you actually see it done, you probably won't understand how either soap making method—cold process or melt and pour—really works. The video presentations gathered here will give you an extra bit of "how to" information and, hopefully, some confidence. Along with an accompanying set of step-by-step instructions, these videos serve as great primers to get you started making your own soap in no time. Many people fear making cold process soap from scratch because of the lye. While lye can cause burns, like any chemical, it can be dealt with safely and properly. 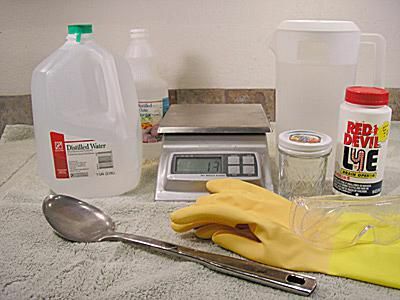 Learn how to safely make lye solution, and you'll be on your way to homemade soap in no time. With its extra proteins, vitamins, and caseins, which are good for your skin, goat's milk is one of the most popular additives people put in their cold processed soap. See how to add goat milk to your soap using three different methods: using fresh goat's milk, powdered goat's milk or canned evaporated goat's milk. Felted soap provides extra exfoliating scrub in the shower, and making it at home is an inexpensive and simple project. You'll need a bar of fully cured soap, some raw wool, a ribbed mat and the bottom of an old pair of pantyhose or knee-highs. Watch how to felt soap using wool. Whipped soap is a variation of cold process soap that is done at room temperature. This process is different from the norm in a couple of ways. Rather than beat the melted oils and lye in a hot soap pot, you whip the oils and the soap in a bowl, and you work at room temperature instead of at about 100 degrees. The result is a white opaque soap that takes tints beautifully. Personalize your soaps by pouring them into pre-made molds made especially for that purpose. Make basic shapes like circles and squares or have fun making interesting novelty shapes. You can even use molds designed for making chocolate shapes. You can make shapes with both pre-made melt and pour soap and with cold process soap. Melt and pour soap is incredibly flexible, and you can use it in lots of creative ways. All sorts of whimsical and beautiful holiday soaps are made this way. Check out the video for fun novelty Christmas soaps. Use your imagination and cut colorful soaps you made in the past into small or large chunks for inclusion in new distinctive bars. You can even cut slivers of soap and add them to new bars. Arrange the chunks or slivers in the molds and then pour new—often clear—soap over them. The colorful chunks/slivers show through and add a fun touch to the bar. When you're already skilled in cold process soap making but are in the mood for something different, mix up a batch of liquid soap. You'll still need a batch of lye solution, but the magic is in the stirring, which occurs every half hour over three or four hours. Eventually, you'll be able to pour your soap into your choice of attractive containers for home use or gifts.